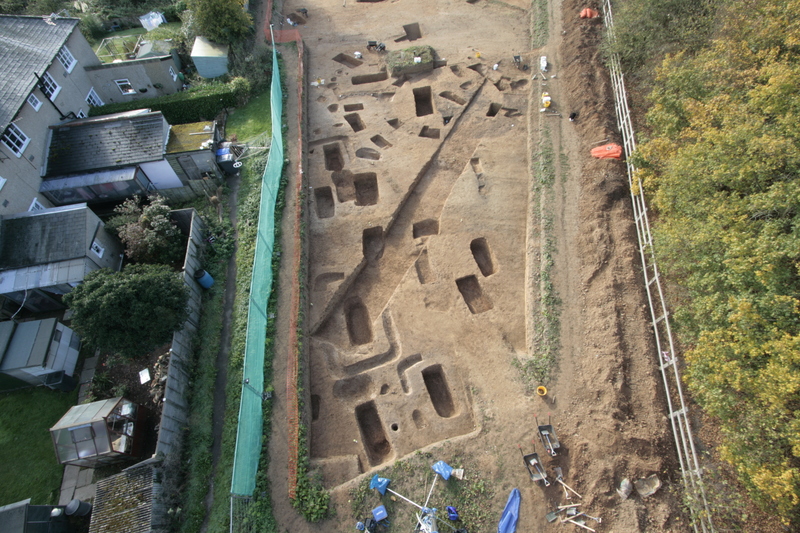 PCA Warwick excavated the site of a new housing development in Ashchurch, Gloucestershire. The site lies about 4.5km to the east of the historic town of Tewkesbury and is positioned between the River Tirle (also known as the Tirle Brook) along the southern side of the site, and the A46 directly to the north.The number of Historic Environment Record ‘hits’ previously observed in the area had for some time suggested Bronze Age through to the later Romano-British activity along the line of the A46 road to the north of the site, reinforcing the view that this route originated in Pre-history and has remained an active thoroughfare since that date. Geophysical survey and follow-up evaluation preceded our excavation, and revealed extensive evidence of settlement activity, concentrated on a distinct plateau of high ground alongside the road and overlooking the flood plain of the Tirle Brook. The plateau is still distinctly visible in the present day landscape and the depth of post-Roman subsoil accumulation at the base of the slope close to the Tirle Brook indicates that it would have been even more prominent in the prehistoric and Roman periods. The proposed development was designed to skirt around the main Romano-British settlement activity, covering fields either side of Pamington Lane within the lower floodplain area. It is across these fields that PCA’s excavations were focussed. The findings reflected the fact that the excavations were located in more marginal, agricultural land, with the features being restricted predominantly to drainage ditches, possible outlaying trackways and agricultural enclosures as well as a well-preserved corn dryer and possible well. The fieldwork was undertaken through the depths of a particularly cold and wet winter, and PCA had to overcome considerable challenges presented by coordinating large-scale earth moving and archaeological excavation across waterlogged clay deposits, implementing a number of measures including haul-roads and water management systems. As a result the archaeological excavations were all completed, as programmed, in advance of the commencement of the development in Spring 2018. PCA worked closely with the client’s development team and was also able to act quickly to amend the location of trial trenches to meet required revisions to the housing scheme. The investigations revealed evidence for Late Iron Age activity in the form of enclosure ditches and associated material culture including imported pottery and a large faunal assemblage, both of which are indicative of high status activity. The most significant results from the excavation comprised an extensive, well-preserved and occasionally deeply-stratified Romano-British cemetery. Nearly 300 cremations and 100 inhumations were recorded. 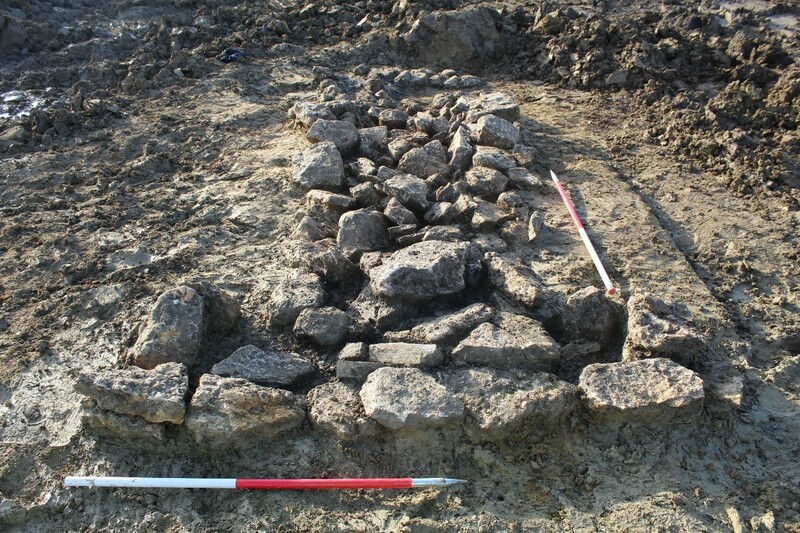 Burials were uncovered across the site; with the southeast corner the primary focus for the cremation burials, including evidence of funeral pyres. The vast majority of the cremations were placed within pottery urns, with many of the burials containing grave goods in the form of further pottery vessels, hobnail boots and jewellery. The burials were recorded and removed according to the WSI.